Oh, are you really going to make me choose? This is going to be difficult. I guess I'd have to go with Mockingjay by Suzanne Collins. Something about it reached down deep and touched me. I was already in love with the first two books, but this breath-taking sequel took my adoration to a whole new level. Beautiful. The worst book I read this year was probably The Fetch by Laura Whitcomb. Bleh, I could not stand that book. The slow pace and the black-and-white characters drove me insane. Not to mention that the synopsis promised a tale of forbidden romance. Let me tell you, there was NO romance worth reading about in that book. Pegasus by Robin McKinley. The cover is breathtaking, but the story itself was rather dull in my opinion. It moved so slowly, and the main character wasn't my type. I had such high hopes for the book, but it fell flat for me. 4. Most Surprising (in a Good Way!) Book in 2010? I think I have to go with Under My Skin by Judith Graves. It didn't look like much, but I decided to give it a shot. I was pleasantly surprised with the book. Action-packed and romantic, this was a novel I thoroughly enjoyed. 5. 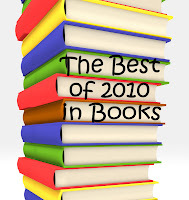 Book You Recommended Most to People in 2010? This is a hard one. I found so many amazing series this year. One of my favorites was The Darkest Powers series by Kelley Armstrong. This was an incredible, addicting trilogy that I adored. I had the wonderful opportunity to meet Kelley Armstrong, and her dedication to writing made me appreciate her novels even more. Lisa McMann, Jennifer Laurens, Suzanne Collins, Kimberly Derting, Kelley Armstrong, Alexandra Adornetto, and so many others! My list is so long. 8. Most Hilarious Read in 2010? Another tough one. Is it alright if I name a series? Because I read the Dream Catcher series by Lisa McMann within a couple of days. I loved them. The characters and plot were so emotional. I couldn't get enough! I anticipated so many of this year's books. My top three would probably be Mockingjay by Suzanne Collins, The Reckoning by Kelley Armstrong, and Linger by Maggie Stiefvater. There are so many beautiful covers to choose from, but my favorite is probably Halo by Alexandra Adornetto. I adore this cover. The angel's wings, golden sunlight, characters' silhouttes, and font are gorgeous. Oh my. Not to mention The Hunger Games series again, but seriously, Katniss is one of the most amazing heroines I've ever read about. Her strength and intellect made me respect her. Katniss is just one of those characters that will stick with me for a long time. While I think all of my favorite books are beautifully written, Heavenly by Jennifer Laurens was probably the most emotional, beautiful book I've ever read. Loved, loved, loved it. Probably Change of Heart by Shari Maurer. The thought of living life day-to-day, never knowing if you will live to see the next year, was terrifying. The moral of the story inspired me to embrace every day. You never know when your life will change. Well, that's pretty much 2010 in review. Reading-wise, that is. I cannot wait to see what amazing new stories and characters 2011 will bring. Yay for the Hunger Games! I know what you mean about Pegasus - I didn't manage to get very far into it before it had to be returned to the library, but the bit I did read was a very slow beginning. The cover is gorgeous, though. Good Best Of Amber! We read a lot of the same things. You didn't like Fetch that much? Hmmm, bummer. I liked it, but I knew it was more a MG book than YA. I loved Certain Slant of Light by the same author. My daughter's favorite author is Kelley Armstrong - she is amazing! Check out her adult books too! Wow--so honored and pleased that you enjoyed "Change of Heart" so much. Thanks! I love your list! I completely agree with everything you put about The Hunger Games. Katniss is an incredible character! She is easy to relate to, but she also goes through so much while staying strong. She is hard not to like. Okay, I think Halo has one of the most amazing covers I have ever seen!